Shannon, Ireland — A few miles from here, Phoebe Prince and her family left for America in 2009. Now her remains lie buried not far from where she grew up. The circle of life and death has rarely seemed so cruel. No doubt the family was apprehensive as well as hopeful the day they left, looking forward and looking back to what was left behind and what the future would bring. 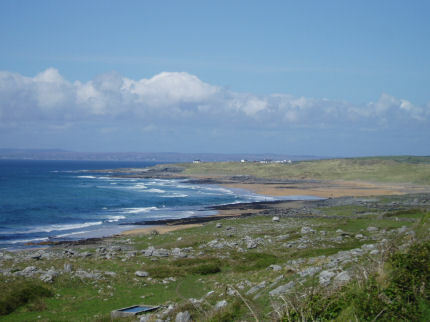 Jeremy and Anne O'Brien Prince had settled in the little West Clare town of Fanore (photo above) 11 years previously from England. He had worked a blueberry and fruit farm and sold produce to the locals. People here say many such idealistic outsiders have moved into West Clare over the years, the bucolic setting and smal- town values make it a perfect place to raise a family. He is remembered as a real green-fingers phenomenon, a man who made a living in good times and tough times. Anne became a schoolteacher locally and her kids. Her four girls and a boy were well-liked, well-mannered kids. Phoebe went to school in the exclusive Villiers college in nearby Limerick. She is remembered there as a warm, outgoing girl popular in a coed boarding school environment where fast friends were made for life. Villiers has a Protestant ethos and is fee-paying. The student body is multi-denominational and diverse, including students from Spain, Mexico, South Africa, Germany and Russia. It is a nursery for many distinguished former pupils including politician Jan O'Sullivan. It has a unique reputation as a nurturing environment. Phoebe thrived there. Fanore is a little seaside village, a town on a road to somewhere else, usually nearby Lisdoonvarna, a huge tourist town, or Doolin, where Irish traditional music was reborn about three decades ago. One can only imagine what the change to America and the much-faster pace meant to Phoebe when the family resettled in Massachusetts. It must have been a very difficult time. Her father stayed behind in Clare. Her mother, whose family hails from the South Hadley area, had wanted to reconnect with family there. Phoebe the country schoolgirl would have found it difficult to relocate no matter what. Unknown to her parents though, she was entering a school where bullying was tolerated and school administrators did not want to be bothered. It was all a huge contrast from Villiers, where supportive teachers had a mission to nurture their pupils, and one-on-one attention assured that no one was left out. In such an idyllic rural upbringing and a nurturing school environment, Phoebe Prince seemed to thrive and put down solid roots in the community in Ireland. Like many emigrant families, starting over in America was a massive undertaking. it all went horribly wrong for Phoebe, of course. Locals back in West Clare were deeply traumatized by what had occured. In Shannon and Fanore yesterday, the daffodils have at last bloomed after the harsh winter and delayed spring. Perhaps they grow on Phoebe's grave, too. But she will never be around to witness their beauty again.